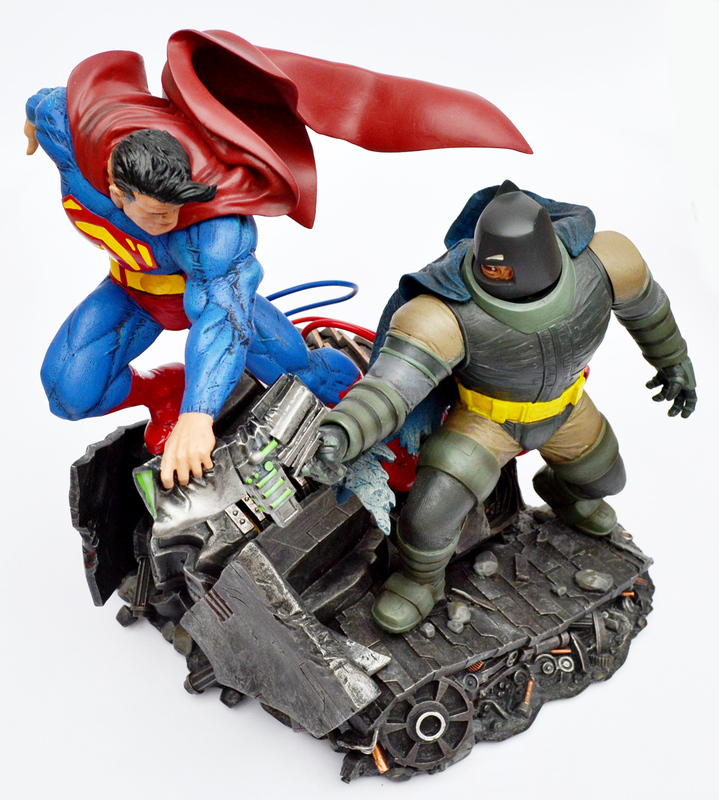 The Dark Knight Returns: Superman Batman statue | 'TAIN'T THE MEAT… IT'S THE HUMANITY! 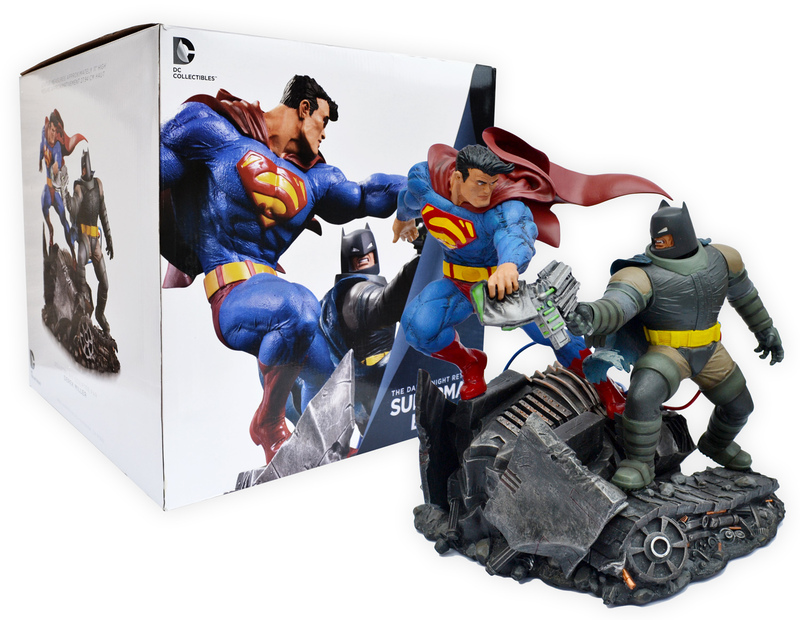 Drawing inspiration from one of comic’s most iconic scenes The Dark Knight Returns: Superman Batman Statue was released by DC Collectibles in August 2012. Frank Miller’s The Dark Knight Returns was published in 1986 and was an instant hit. The gritty, violent and noir-ish epic helped to not only redefine Batman for the coming decades, but it also finally put to bed the camp interpretation of Batman that had plagued the character since the 1960’s. The four-part story included dozens of memorable scenes but the one that stood out the most was the climatic battle between Batman and Superman. 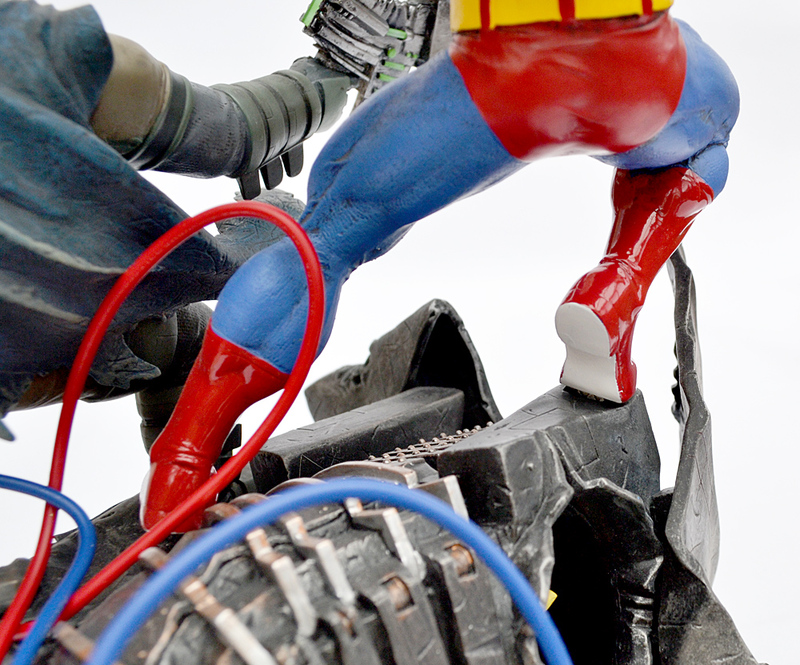 In the scene a heavily armoured Batman, plugged into Gotham’s power supply, faces off against the Man of Steel while both stand on the wreckage of the recently demolished Batmobile. This painted cold-cast porcelain attempts to do that epic battle justice, and succeeds admirably. 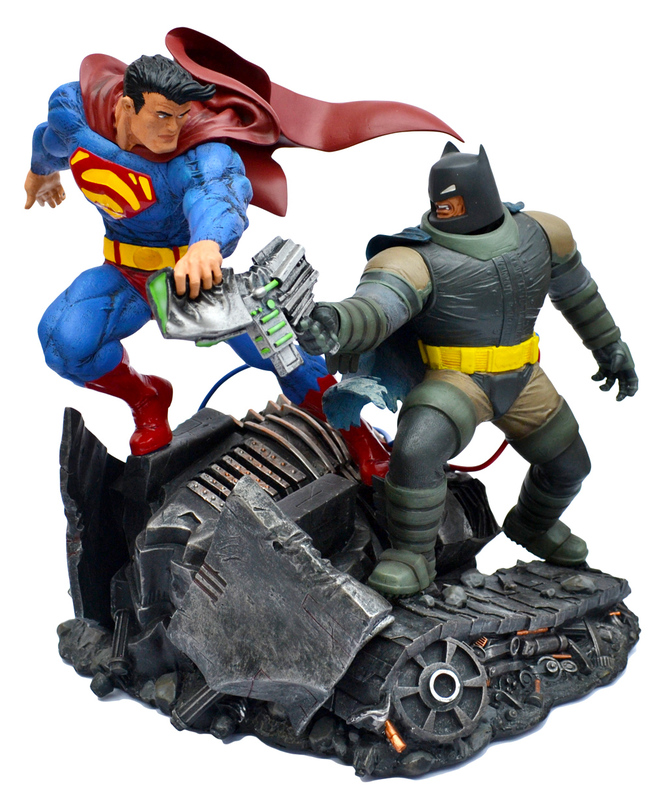 The Dark Knight Returns: Superman Batman Statue was sculptured by Derek Miller and was based on Frank Miller’s distinctive artwork. 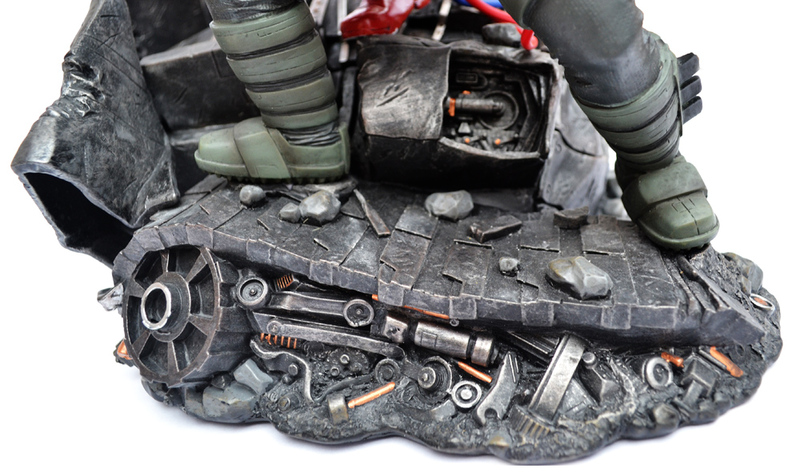 Derek Miller, a veteran sculptor with over 15 experience, did a great job interpreting the scene and the level of detail is very impressive, particularly the broken tools and rubble at the base of the demolished Batmobile. Miller has also done a fine job on Superman’s costume, with each straining muscle reproduced to great effect; I also like the dramatic sweep of his cape. 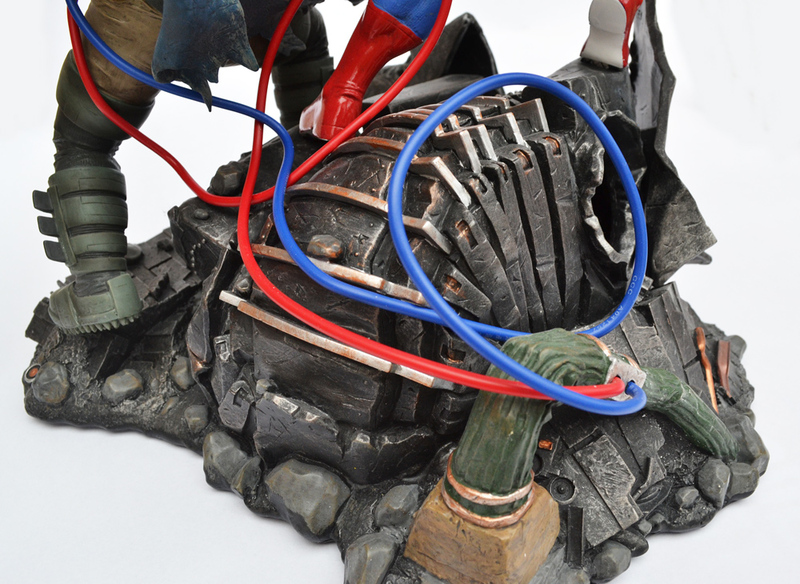 And the addition of real wires connecting Batman to the city’s power supply is a nice touch. The paint job on the statue is also of a high standard, especially on the shattered Batmobile. And Superman’s chest symbol and boots are glossy, another nice touch. The base of the statue features some nice details. The statue measures 12 inches tall by 11 inches across and weighs more than two kilos: in every sense of the word, this is a big statue. The statue comes in one piece and ships securely in a very large box between two pieces of polystyrene. The ‘real’ wires are a nice touch. The statue even reproduces the white of Superman’s soles from the original comic. 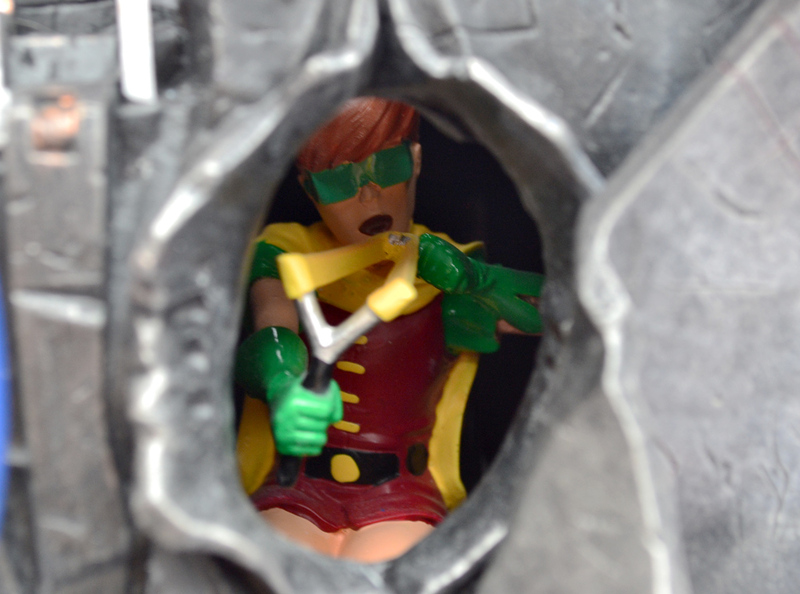 Fans of the original comic will also remember that Batman and Superman weren’t the only two combatants in the battle — Carrie Kelley, the new Robin also featured, and she makes a cheeky appearance in the statue too. The Dark Knight Returns: Superman Batman statue, all sides. The Dark Knight Returns: Superman Batman Statue originally retailed for $250/£200, but, as always, hunt around and you’ll find it a bit cheaper — I paid £119/($150) for mine. This is the fourth DC Collectibles statue I’ve purchased over the last couple of months (the other three are The Sandman Overture statue, Batman & Killer Croc and iZOMBIE). The quality of all four has been extremely high and they all now take pride of place in a glass display case in my office.